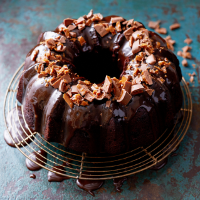 A showstopping cake with a fudgy, banana crumb, slick of decadent icing and Daim bar crown. 1. Preheat the oven to 190 ̊C, gas mark 5. Melt 2 tsp butter and use to brush the inside of a 2.5 litre bundt tin, getting into all the nooks and crannies. Dust with cocoa, covering every surface, then hold the tin upside-down and tap to get rid of the excess. Mash the bananas with a fork until smooth, add the soured cream and vanilla; set aside. 2. Tip the caster and muscovado sugars and 200g butter into the bowl of a freestanding mixer; beat well until pale and light – about 3-4 minutes. Gradually add the egg, scraping the sides of the bowl with a spatula as you go. Now add the banana mixture, flour, corn flour, baking powder, bicarbonate of soda, 50g cocoa and a pinch of salt, mixing to combine thoroughly. 3. Fold the chopped Daim bars (or chocolate) into the mixture, then spoon into the tin. Level with the back of a spoon and bake on the middle shelf of the oven for 30-40 minutes, until well risen and a skewer inserted into the centre comes out clean. Leave to cool in the tin for 2-3 minutes, then turn out onto on a wire rack and leave to cool completely. 4. For the icing, gently heat the sugar, butter and cream in a small saucepan until dissolved. Bring to the boil and simmer for 30 seconds. Remove from the heat, add the chocolate, vanilla and a large pinch of salt and stir until silky smooth; leave to cool for 5-10 minutes. 5. Carefully spoon the icing over the cooled cake, allowing it to drizzle over the sides. Leave to set for a few minutes before scattering the top of the cake with more chopped Daim bars. Leave to set completely before serving.